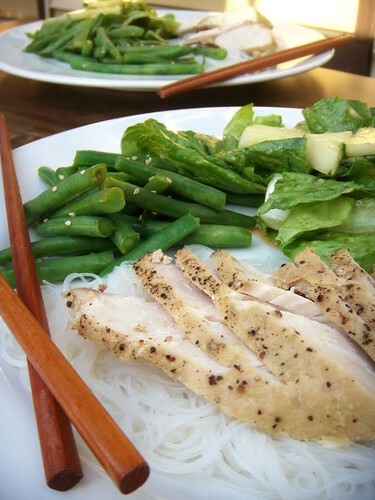 steamed alaskan white king salmon, soy and ginger salad, and seasoned beans, originally uploaded by aarn! +30th July, 2008+. a large piece of alaskan white king salmon started it's journey in, well, alaska. caught by one of the franklin's grandsons, frozen, and hand delivered to boston, i'm not sure how much of this kind of fish actually leaves alaska. filled the pressure cooker with about an inch of a 50/50 solution of bianco and water, with a pinch of bay leaf mixed in, then dropped the cage steamer in the bottom, and placed the salmon on top. while steaming, the salmon was brushed a few times with a mixture of soy sauce, wasabi, pepper, and sesame oil. after it was steamed the fish was chilled overnight. fanned the cold white king salmon over a bed of chilled rice vermicelli, which had been lightly seasoned with sesame oil. green beans were lightly blanched and tossed in a splash of seasoned rice vinegar, a pinch of coarse sea salt, and some raw sesame seeds. the salad was romaine, green onions, and cucumber tossed in a vinaigrette made from fresh ground ginger root, fresh ground garlic, seasoned rice vinegar, a little sesame oil, canola oil, lime juice, soy sauce, a little wasabi, honey, dry anise, and cinnamon. the salmon had the most incredible flavor and the entire meal ended up costing less than $2.